The first actual round of the CyberCenturion competition started off this weekend, and our teams (17, 18, 19) took part on Friday. After what seemed to be quick starts for two of them, they plateaued for a number of hours trying to solve the last one or two items in the images. Out third team got off to a slower start, but managed to get near the top in a more gentler fashion. But before we see what needed to be done, we almost didn’t get a chance to start on time. To set up 6 computers ready for the competition would take around half an hour, but I went to the computer classroom before that to make sure everything was running, around quarter past 12. Four of them were set up by half past, but then the fire alarm went off. Luckily, I had just started to extract some of the images so left the computers to get on with it while everyone went outside. Usually, our fire alarms last only for around 5 minutes till everyone can go back in. This time it took 20 minutes, so that only left 10 minutes to get everything else up and running. Talk about cutting it fine! 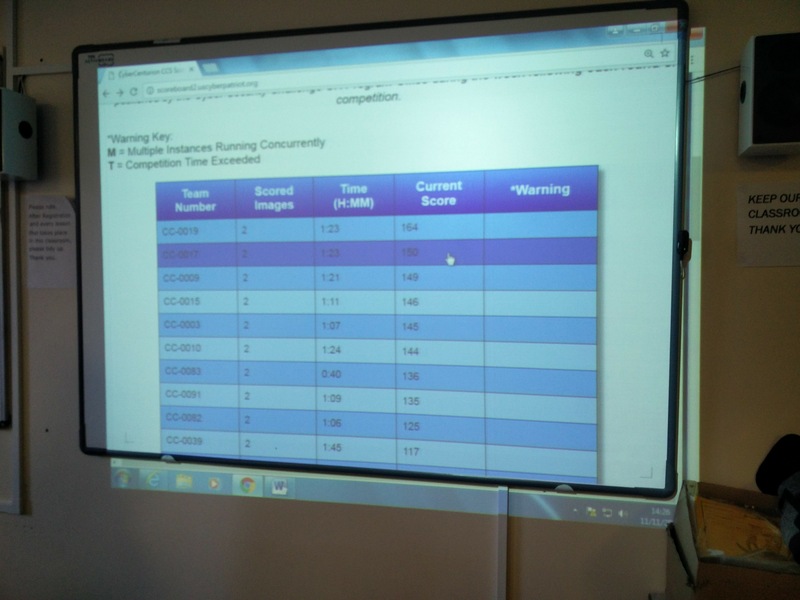 Anyway, after a quick rush to get the remaining computers ready it was time to start the competition. Immediately two Windows 7 images and one Ubuntu image crashed, meaning they had to be re-extracted, taking some time away from the teams. Luckily, as the competition is six hours long, it only took about 5 minutes from their overall time. Then it was just a case of letting the teams get on with solving the problems and walking around to see how they got on. 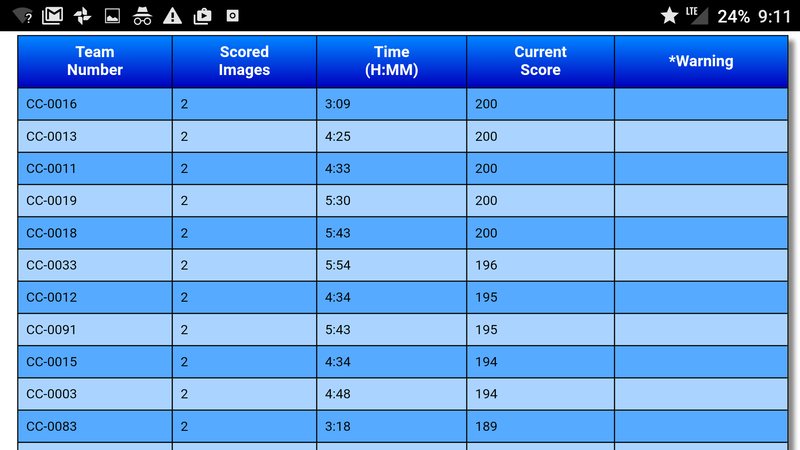 After 45 minutes of the competition, two of our teams (17, 19) were onto a strong start coming in 2nd and 3rd place. Our third team (18) went off to have lunch, so they were further down the scoreboard. 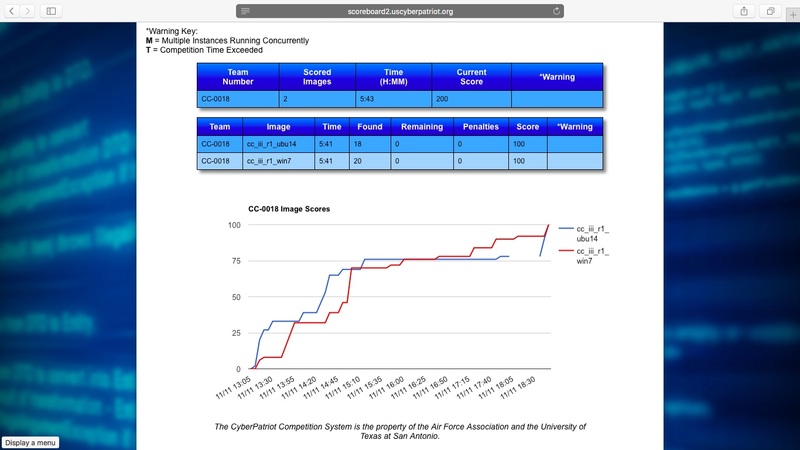 Five minutes later, one team (19) then came out on top, with 2nd place team (17) dropping to 5th as other teams around the country gained points. For the next 40 minutes of so, one of our teams (18) were climbing slowly up the leaderboard, the other team (17) jumping back up to second and our last team (19) gaining a few more points to reach 164. Two hours in, and one team (19) had completed all but one of their Windows 7 ‘problems’. It was here they stayed for the next 3 and a bit hours trying to find out the missing item, trying all manner of weird ‘fixes’. An hour after nearly finishing their Windows 7 image, that team (19) were then in the same situation for the Ubuntu image needing just one more item to fix. The other teams were still coming along, albeit slightly behind this one. 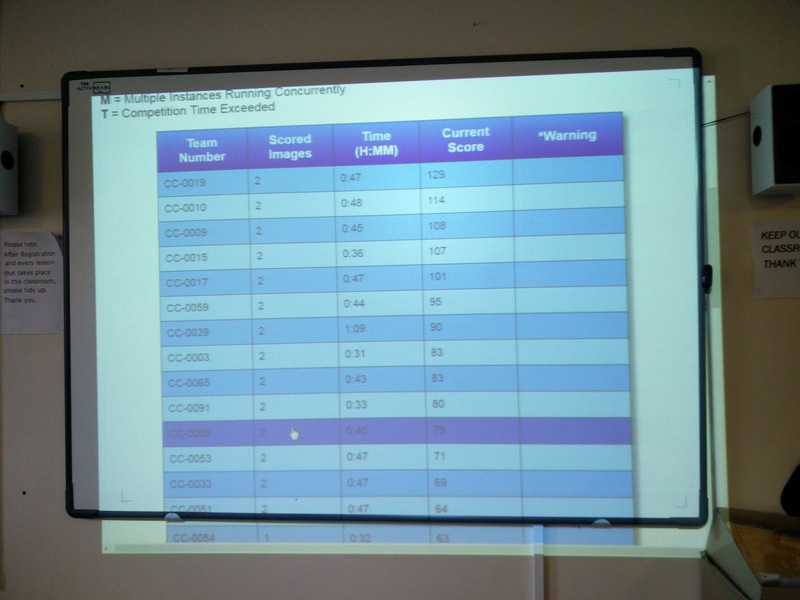 By the time it was half 4 the teams (17, 19) had run out of ideas and started to slip in the overall scoreboard as other teams figured out what needed to be fixed. Five o’clock rolled around, and both had slipped even further. Knowing they were so close but seeing their leads dropping, they decided it was time to have pizza. 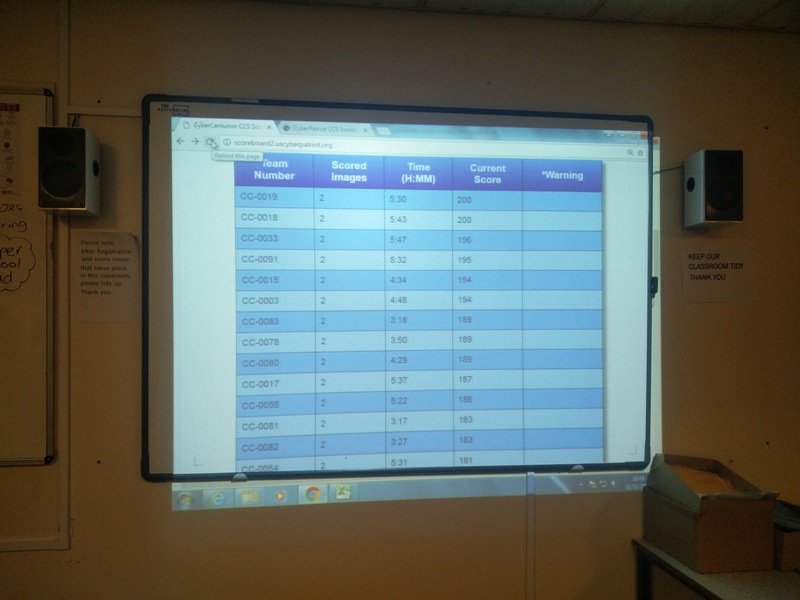 By half 6, fuelled by pizza and desperation to find what was missing, one team (19) had a stroke of genius and found a FTP program that was running on the Ubuntu image that shouldn’t have been. This bumped their score to 100 on that image, and made them push harder to get all of the problems on the Windows 7 image too. 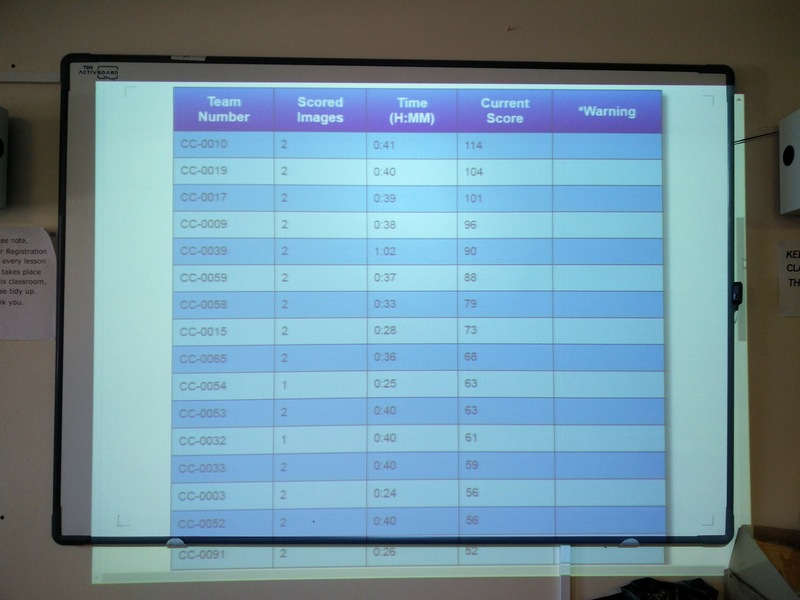 Three minutes later, one of the students who had been working solely on the Ubuntu image for that team (19) jumped over to the Windows image, and thanks to a fresh pair of eyes, spotted the last problem to get them the 100 points, leading to an overall perfect score of 200 in total. Six and a half hours in, the team (19) were finally pleased with their result. Hearing the celebrations from this team, it pushed the other teams (17, 18) to find what other problems they hadn’t found. 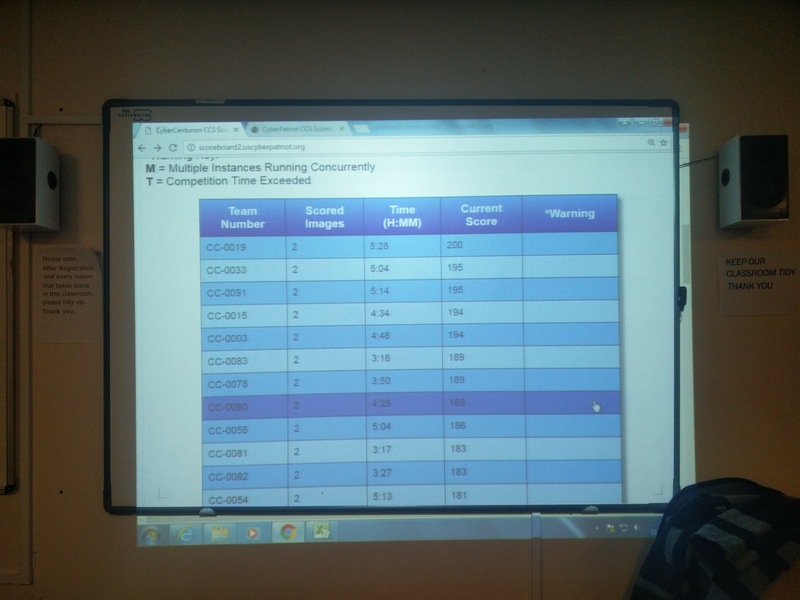 Unfortunately, one of the teams (17) had managed to lock themselves out of their Ubuntu image, so they weren’t able to get the full amount of points. 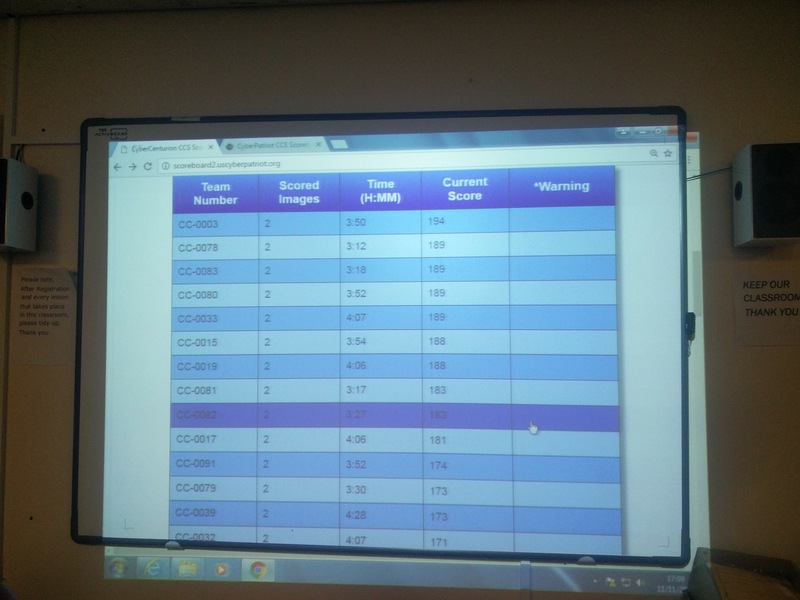 The last team (18) did a final push and managed to solve a fair few items right at the last moment, getting them a score of 200 too. 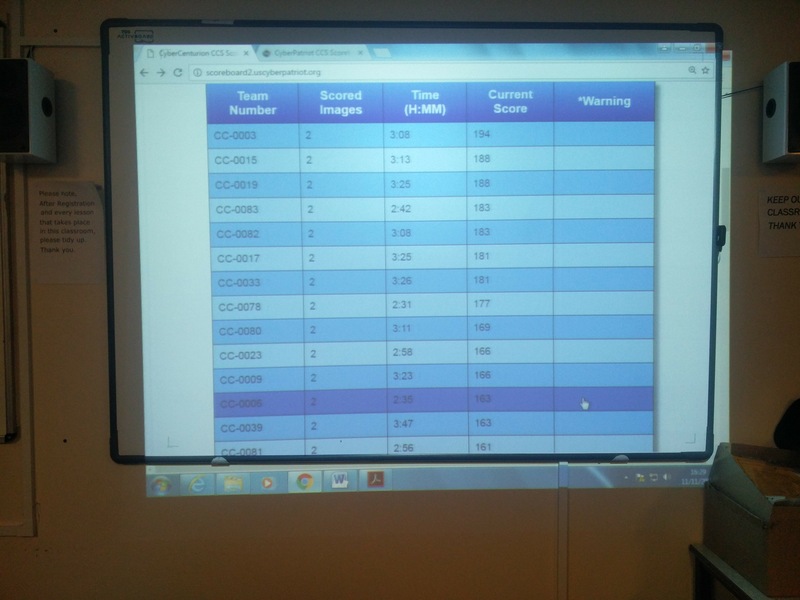 Update Sunday 13th November: After waiting for all of the other teams taking part in the competition to get their scores in over the weekend round slots, this is how the top of the scoreboard looks. Disclaimer: To prevent any unfair advantages to teams taking part in the competition, this post has been published after the last competition day for round 1.